One of the things I mentioned on Day 3 was the element of prayer and how important it is in the waiting process. It is an active, highly important part of the process. I Thessalonians 5:17 says “pray without ceasing”. Do you do that? Let’s Just Be Honest: I don’t characterize my spiritual walk as one that is filled with continual, unceasing prayer. HOW are we to pray without ceasing? How do we do that? I think part of it is a training of our hearts and minds. 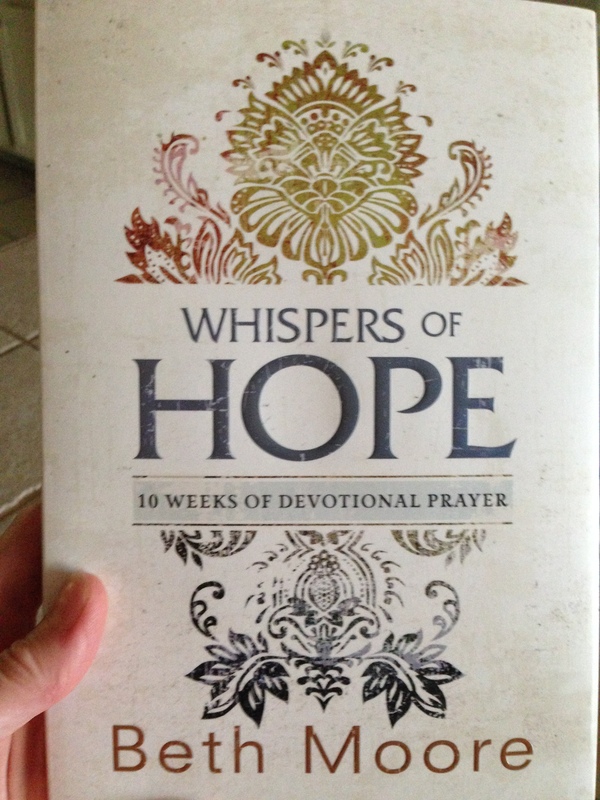 I just bought a new book that is a 10 week devotional on prayer; it’s called Whispers of Hope by Beth Moore. The purpose is to help build a habit of prayer. It includes daily devotionals, a prayer guide to follow daily to incorporate all great elements of prayer (praise, thanksgiving, repentance/confession, requests) and a section to record God’s answers to prayer. I started it just this week and love it. I usually journal my prayers, which I love doing. I just write and get it all out with God and then reframe my mind to truth and sit and listen to Him a while. How do you meet with Jesus on a regular basis? Would a book like Whispers of Hope be helpful for building a habit of continual, constant prayer? Join me, we’ll grow our prayer habit together!